They’re gonna need him this weekend. No, I’m not talking about Hobey Baker candidates Connor and Kellen Jones. Or ECAC Hockey goals against average leader Michael Garteig. I’m talking about Jordan Samuels-Thomas, a senior who will be Quinnipiac’s x-factor when the Bobcats host Yale this weekend in the ECAC Hockey quarterfinals, a best-of-three set. Aside from dressing on Feb. 28 at St. Lawrence, Quinnipiac has been without Samuels-Thomas for six games this season due to injury, and the team went 1-4-1 in that span. JST, as he is referred to by Quinnipiac fans, last appeared against Clarkson at home on Feb. 7, recording an assist. The nature of the injury is unknown. There have been rumblings about a shoulder issue, and Samuels-Thomas has been seen with his arm in a sling. The Quinnipiac men’s ice hockey team, through a spokesperson, declined to comment on the injury. Regardless of the injury or its form, the Bobcats will need Samuels-Thomas to contribute this weekend. And the stats prove it. Through 36 games this season, Quinnipiac has tallied 128 goals, good for an average of 3.56 per game, fourth in the country. In 30 games with Samuels-Thomas in the lineup, Quinnipiac has racked up 117 goals. Yet in six games without the senior, the Bobcats have found the net just 11 times, an average of 1.83 goals per game, which would be the second-lowest rate in the country over the course of a full season. Putting it into perspective, if Quinnipiac goes a whole season without Samuels-Thomas at that rate, it would score 66 goals, 51 fewer scores than its total with the forward. Yes, Quinnipiac did put up four goals at Yale in February without Samuels-Thomas in the lineup, but the offense has struggled without him. In his two-year career as a Bobcat, Samuels-Thomas has combined for 56 points. Last season, he led the team in goals with 17. This year, he has scored 12 times, and would likely have more goals if he wasn’t injured. When Samuels-Thomas scores in a game, the Bobcats are 11-0-1. When he doesn’t even score a point? 6-5-5. As Pecknold stated, Samuels-Thomas’ defensive ability cannot be underestimated. Day in and day out, he will forecheck across the offensive zone, outrace opponents and battle in the corners. Without him, Quinnipiac loses a 6-foot-4 two-way forward and a key goal scorer. His spot on the second and third lines has also been missed. Freshmen Tommy Schutt and Tim Clifton have shuffled into the senior’s wing spot, yet the absence of Samuels-Thomas has still been felt. The physical line of Bryce Van Brabant, Cory Hibbeler and Samuels-Thomas is a stark comparison to the former two with a freshman subbed in. “When we have him, we’re a three-line team,” Pecknold said. Last but not least, Samuels-Thomas has had the hot hand when it comes to late game-winning goals. Last season at Maine, he notched the go-ahead goal with 96 seconds left in regulation, leading Quinnipiac to a 2-1 win. Later on in the season, Samuels-Thomas scored an overtime winner against Dartmouth at home. Two months ago, he recorded another game-winning goal against Maine with 63 seconds left. Against Yale in a best-of-three set at home, it would invaluable to have Samuels-Thomas on the ice in those late-game moments. That said, the Bobcats don’t play just one game this weekend. In potentially playing three games in as many days, team health and stamina will be key. On top of all that, the rival from 10 miles down the road comes to town. Given the current PairWise Rankings, a Quinnipiac series victory would likely eliminate the Bulldogs from tournament contention. 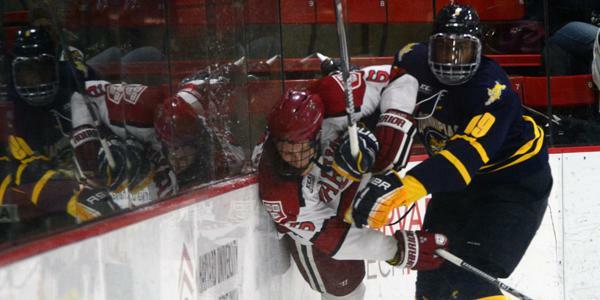 Will Quinnipiac need Samuels-Thomas for this weekend? Absolutely. But will he be dressing come Friday night?